Thanksgiving has come and gone and we can officially begin to think about the holidays. Every year I kick off with my Caitlin Confidential Gift Guide: your go-to for all things gift related. Up first are my carefully selected choices for the Cosmetic Connisseur. Violet Grey Gift Sets (prices starting at $52): Violet Grey offers a luxury boutique makeup experience, making this an extra special choice this year. 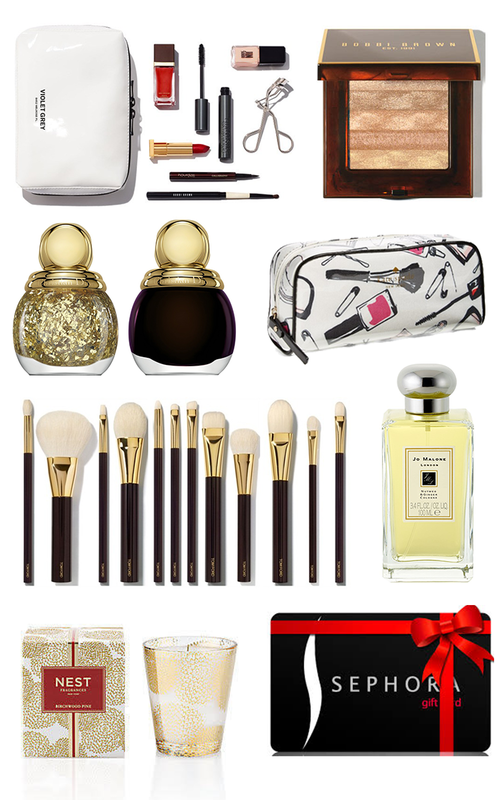 These hand-picked gift sets are perfect for the most devoted of beauty fans. The Classic Beauty Set (shown) is filled with all of the essentials to ooze old Hollywood Glamour. My other choices are The Brigitte Cat Eye Set and The First Class Set for the frequent flyer. Bobbi Brown Copper Diamond Shimmer Brick ($45): This is beautiful gift for anyone or as a little luxe stocking stuffer. Bobbi Brown’s shimmer bricks are great multi-tasking products that can be used as a highlighter, to brighten the cheeks, to create a pretty eye look or as an all over shimmer on the chest and shoulders. I have had my shimmer bricks for years, but this one is extra gorgeous because of the Limited-Edition color as well as the holiday packaging. Dior “Diorific’ Nail Enamel in Smoky and Golden Shock ($27): This is a pick for the nail polish addict. These two holiday releases from Dior are gorgeous alone or layered. I love the shade 'Smoky,' a deep inky purple color as well 'Golden Shock' for a glittery top coat for a dose of extra glam. Kate Spade ‘Shelby Drive’ Cosmetic Case ($68): Every beauty addict has to have a place to store all of her most treasured goodies. I love this cute little makeup bag from Kate Spade with the pop art makeup design. Tom Ford Makeup Brushes (prices starting at $46): The ultimate in beautiful makeup brushes. Start with one and add to your collection as you please. Which first? The Cheek Brush for multi-taking in powder, bronzer, and blush. Jo Malone Cologne (prices starting from $60) A gift from Jo Malone is a fail-proof pick. The ultra chic packaging and divine scents make a lovely indulgence for anyone, but it is a great choice for hard-to-buy-for mothers or mothers-in-law. I love all of the products in the range from the cologne to the candles and bath oils. My favorite scents are Pomegranate Noir and Nectarine Blossom & Honey. Nest Fragrances Birchwood Pine Candle ($34): This is one of my annual holiday must-haves at my house. The combination of white pine and fresh fir blossoms with notes of sweetness from amber and musk, make for the most heavenly of smells that will have guests asking for your secret. I love giving this as a hostess gift. Sephora Gift Card (prices vary): You can never go wrong with a gift certificate to the ultimate cosmetic mecca. The giftee has free reign to finally check out that YSL foundation they have been wanting to try all year or to pick up that Nars red lipstick just in time for New Years.